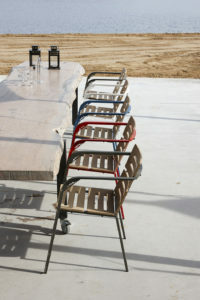 Designer Ruud-Jan Kokke designed a terrace-chair for a restaurant in Arnhem, the T-huis . It is with pride that we can announce that we now have this chair Duke in our collection. The Duke is a refined combination of steel (outdoor-proof) and Iroko-wood, is stackable and super comfortable. The chair is available in various colors like Ruby-red, ocean-blue, Forest-green, night-shade and Bright White. A matching table is next to follow… Send us an email for more information.